This is an acrylic cell phone holder with a steep slant. The slanted nature of this display provides your customers with an optimal viewing angle. The deep pocket will hold any cell phone and keep it securely in place. 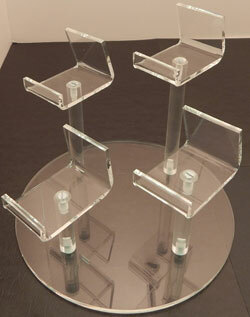 The clear acrylic will make your displayed items stand out and look their best. There is also an area for inserting information or a graphic. The flame polished edges give a clean and smooth finish. An acrylic cell phone display measuring 4 3/4"w x 5 1/4"h. Available for countertop display, slatwall display, and gridwall display. 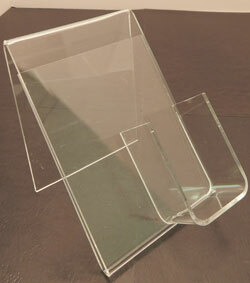 An acrylic countertop signholder measuring 8 1/2"w x 11"h, featuring a cell phone display pocket. Clear acrylic design allows your product to stand out.